Hot Air Ballooning over Northern Maine's Aroostook County. Photo courtesy of Paul Cyr. Adrenaline junkies, you’ve met your match in Maine. Skydive with the best of them along the rocky coast or climb aboard a hot air balloon and let the wind take you where it may. Climb New England’s highest coastal cliffs on a sunny summer’s day or in the depth’s of winter’s chill. Zip down a near-vertical ski-run and launch yourself in mid-air, landing is a cloud of powder at the base. Tackling some of Maine’s extreme sports will give you plenty to brag about. Man’s first foray into the skies was in a hot air balloon. In 1783 one of these lighter-than-air ships sailed across the Paris skyline and forever changed man’s view of the world. Cruising along at roughly ten miles per hour, the landscape appears to glide quietly beneath your feet. A chase car follows your progress, picking you up at landing and carrying you back to the launch site. 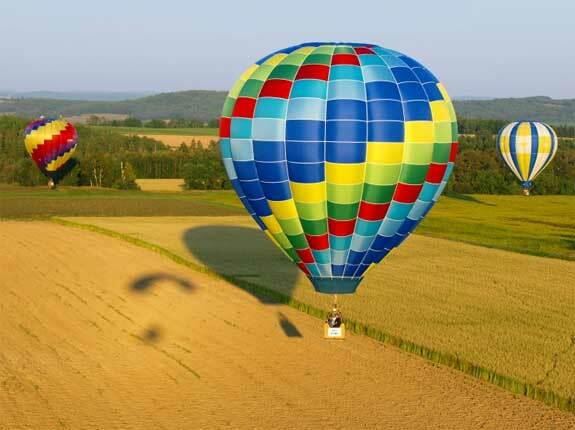 Most balloon trips launch early in the morning or in late afternoon to take advantage of the air currents. Balloon rides include an orientation, the blowing up of the actual balloon, the hour-long flight and the drive back to the launch point. Most balloon adventures are in the $200 to $250 dollar range. Balloons fly from early spring until mid-fall, weather permitting. Auburn, Bangor and Portland, on the coast, are popular launch sites. Maine Balloon Rides (mainehotairballoonrides.com) offers rides throughout much of the state. The firm also offers special romance packages, including the chance to tie the knot while floating high above the horizon. If seeing Maine’s scenic coastline by hot air balloon is just a bit tame, why not try a bit of skydiving? Get a bird’s eye view of the state from the rugged coast all the way to the granite peaks of Mount Katahdin from your 10,000 foot free-falling perch in the sky. Central Maine Skydiving (centralmainskydiving.com) and Skydive New England (skydivenewengland.com) both offer jumps for the experienced and novice skydiver. Experienced jumpers may purchase single jumps, running around $25 per jump, or in blocks of jumps good for a season. The price depends on how many jumps are in that block. New jumpers ride tandem. After roughly an hour of instruction, you and the instructor are attached together, using the same parachute. After jumping out of the plane you free-fall for roughly 35 seconds, then you or the instructor pulls the ripcord. The parachute slows you down for the 5 to 10 minute ride back down to earth. Prices, including the instruction run around $230. The video of your eye-popping journey is extra. Skydiving season runs from the beginning of April through October, weather permitting. The waves off coastal Maine may be colder than those found in the surfing hotspots of Hawaii or Australia, but they are just as challenging. The many miles of sandy beaches offer plenty of board-worthy breakers and a soft landing when you make it onto shore. If you are an experienced surfer, just put on that wetsuit, you’ll need it, grab the surfboard and go. If you haven’t brought along your own board, a number of coastal surf shops have equipment for rent. Those same surf shops offer lessons for the novice surfer. Aquaholics (aquaholicsurf.com) in Kennebunkport offers both long-board and stand-up paddle board lessons. Surf camps for both children and adults are offered, and in this southern Maine location, operate year-round. Lessons are even offered when the snow is falling, taking the sport to an entirely new level. Boards and wetsuits are available by the day or week. Surfboards average $50 per day or $200 per week. Prices for wetsuits and other gear depend on time of year and what equipment you need. Lesson costs depend on whether you want private or individual instruction. Surf camps average $170 per week, including lessons. For those who love the challenge of scaling up a granite wall overlooking the Atlantic, Maine offers some heart-stopping rock climbing challenges. Acadia National Park is home to the highest climbable sea cliffs on the entire East Coast. Acadia Mountain Guides (acadiamountianguides.com) offers instruction and all the equipment you’ll need for a thrilling but safe climbing adventure. Professional guides lead half day, full day and longer group climbs. Prices depend on length of your adventure and whether you join a group or want a private climb. As an example, a half day private climb runs around $150, while a half day group climb with six people and two instructors would run $70 per person. Skiing is a favored sport in Maine with resorts like Saddleback Mountain and Sugarloaf drawing lovers of the snow from across the country. While many resorts offer snowboarding, some offer the chance to ski-jump. Black Mountain Ski Resort (skiblackmountain.org) in Rumford is one of the most famous locales to do both. The family-friendly resort offers a 1,150 foot vertical drop that is a true challenge, as well as a lighted snowboarding terrain park and a tube park for the little ones. Some of the more challenging runs carry names like Dead Cambridge, Upper Rapid and Kennebago. While many of Maine’s more accessible caves are along the rocky coast, there are some hidden deep in the interior. Penobscot Adventures (penobscotadventures.com) offers the chance to tackle some white water rapids and explore some glacially formed caves along Ambajejus Lake that are ice filled throughout the summer. Camp on a sandy beach, enjoy tales around a roaring bonfire, paddle down the challenging Lower Penobscot River and hike into cascading waterfalls. The three-day adventure is offered from June to August, ranging from roughly $329 to $389 per person. It is one challenging way to see some of Maine’s hidden, wild interior. If you happen to be spending any time near the town of Eastport, near the Canadian border, you might consider doing a bit of SCUBA diving. Downeast Diving (downeastdiving.com) offers rental equipment, repairs and PADI certification. Classes for children and young adults are also offered. Downeast also teaches rebreather diving, a type of SCUBA that produces few bubbles, letting you get closer to marine animals. Night diving, wreck diving and ice diving charters are all offered. Rental rates depend on the number of tanks, and other types of equipment you require. A typical complete rental package runs roughly $75 per day. Open Water PADI Certification takes a week, involves bookwork, pool and ocean dives and costs roughly $525 for a private lesson. Find a group of three or four friends and you can get certified for about $455. Maine Divers Scuba Center (mainediversscubacenter.com) offers similar services in the Casco Bay area.